DEARBORN, Mich.--(BUSINESS WIRE)--The number of mobility options available to people has risen dramatically in recent years. In some situations, people use multiple forms of transportation during a single trip. The fast-paced, often experimental mobility sector requires businesses to keep up with agile and adaptable customers. At Ford, the products and services we offer need to reflect these changes. Today, we are excited to be accelerating our efforts to provide micro-mobility solutions with the acquisition of Spin, a dockless electric scooter sharing company based in San Francisco. Spin is a leading micro-mobility service provider, with operations in 13 cities and campuses across the U.S. Spin is committed to working hand-in-hand with cities and universities to implement micro-mobility solutions responsibly, safely and sustainably as they expand their operations. 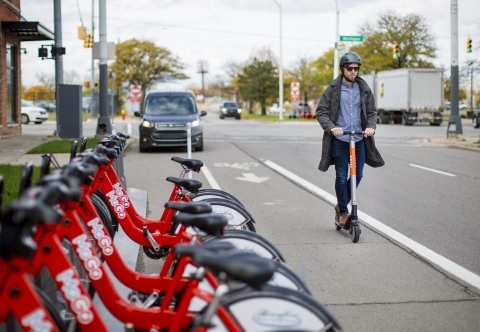 They do not launch without permission; they share usage data with cities; and they work with local officials and university campuses to design educational tools around parking and riding rules. This approach aligns well with our values at Ford and with our aspiration to be the world’s most trusted company. Click here to read the full post about the announcement on Medium.